Why should I join a racing syndicate vs. racing my own horse? In brief, it will be more fun, much more cost-effective and will give you a far greater chance of racing success at higher levels. What’s the difference between a Dare To Dream Stable Partnership and the "Racing Clubs" being offered at some race tracks? In short, plenty! First & foremost, you aren’t getting anything close to a true ownership experience in these racing clubs. In fact, you don’t even really “own” the horse at all. You are essentially one of 200 people “leasing” the horse for the meet. You are actually put in a position where you almost have to hope you don’t end up with a good horse, because it is going to be taken away from you at the end of the meet, no matter what. You will also not get any profit at all from it. While profit should not be the primary reason to get involved with race horse ownership, it’s surely not something you wouldn’t want to partake in if you are fortunate enough to have a nice winner! While we exist for and encourage multiple ownership groups, it’s quite difficult if not impossible to really feel a part of it all when you are in a group as large as 200 people. Dare To Dream Stable partnerships are generally 6-25 people. It’s a much more intimate experience overall. There are many other reasons that these racing clubs are true ownership experiences. If you’d like to find out more, please contact us with that specific question and we can get into more detail. Who is the Management Team at Dare To Dream Stable and what is their function? The Management Team consists of Michael Faber and Allen Faber. Michael is a graduate of the University of Wisconsin – Madison and also a licensed attorney in Illinois. He has been involved in thoroughbred racing since 1996. Allen Faber is also a graduate of the University of Wisconsin – Madison. He is a former restauranteur and has been involved in Thoroughbred racing since 1997. Learn more in the “Management” section. The Management Team forms and manages thoroughbred racing partnerships comprised of a small to moderate number of partners, affording them the opportunity to share in the thrills and excitement of owning a racehorse in a much more affordable way than going it alone while enjoying experienced & professional management. How are the Dare To Dream Stable horses acquired? Dare To Dream Stable acquires horses through various methods. Horses are acquired at 2-year-old in training or yearling sales, via private purchase through our extensive network of contacts and via the claim box. How is the Management Team compensated? Why should I choose Dare To Dream Stable over another partnership? Dare To Dream Stable has a proven track record of 13 years of excellent racing results. We pride ourselves on integrity along with an open, honest & readily available communication style. Our partners are provided with a comprehensive ownership experience. We believe that we do a better job at selecting horses and providing much more value for the dollar than most other syndicates. We do our utmost to control costs & overhead in order to give our partners the best chance to maximize their enjoyment while having a chance to be profitable or minimize losses. For more reasons, view the “Why Dare To Dream Stable” page. Where do your horses race? Dare To Dream horses race mostly in Kentucky, Illinois, Arkansas, Louisiana Maryland, New York, Kentucky, California, Pennsylvania, Florida, Minnesota and Delaware. We ship selected horses to other tracks at times when appropriate and have run at the vast majority of tracks in the U.S. at some time or another as well as in Canada (Woodbine) and even at Sha Tin in Hong Kong. Is it better to buy a very large percentage of one horse or purchase multiple horses with a bit lesser percentage? This depends in part on your discretionary spending budget. In general, we feel that it’s best to diversify and have multiple horses at a bit lesser percentage each as opposed to putting all your eggs in one basket with a very large percentage of one horse. Spreading risk always increases your chance of success, increases your opportunities for excitement and action and gives you more opportunities to reach the Winner’s Circle. When are new partnerships formed and made available? Why get in early versus waiting until a horse is almost ready to run? We encourage potential partners to join in as soon as possible after a new horse is made available for several reasons. First, you are getting the most for your money by deriving the enjoyment and experience for the greatest amount of time, since everyone pays expenses from the time the horse is first syndicated, no matter when they eventually join. Additionally, you will likely have more options to choose from. Some horses sell out more quickly than others and you can certainly get shut out of certain opportunities by waiting. Lastly, incentive pricing is usually offered at the beginning for those that get in early and prices of the horses can increase over time for those getting in later. This applies to the horse purchase portion of a partnership only, as the expense $ is based on actual expenses with no markup at all. What perks am I entitled to if I join a Dare To Dream Stable Partnership? You can obtain an owner’s license in most states where your horses race. Some states have a minimum ownership percentage requirement. In those instances, Dare To Dream Stable essentially leases the horse for the purpose of racing. You are encouraged and welcome to visit the stable area in the mornings to see your horses train and watch them during their barn routines. We do ask you to schedule these visits through the Dare To Dream Stable Management to ensure a safe environment and to keep things manageable for our trainers and their staff. On race day, the partners get together in the paddock before the race to meet the trainer and jockey while experiencing the pre-race excitement and pageantry of their horse getting saddled and heading to the track to run. When our horses are fortunate to cross the wire first, partners share in the ultimate joy and exhilaration of making their way into the Winner’s Circle for the glorious photo. Each Partner receives a copy of the win photo as well. You can find more information on Partner benefits by visiting our Perks of Ownership page. Can I get an Owner’s License, what are benefits and costs? Yes, in most circumstances with the assistance of the Dare To Dream Stable Management team. Owner’s license costs are typically in the range of $25 to $150 per year, depending on the racing circuit. Some of the benefits of obtaining a license are unrestricted access to the backstretch as well free admission & parking at the track. How am I kept informed on the status of my horses? Partners receive frequent email and other communication from the Management team. In addition to the email communication from us, partners are welcome to email or call Michael or Allen directly with any questions/concerns on anything or even just to talk “horses”. Financial reporting detailing the income and expenses of the horses is either done monthly or quarterly, depending on the partnership. When will I know that my horse is running? Generally, entries are taken 2-4 days prior to the day a race is scheduled to run. Partners are almost always informed prior to entry day of our plans to enter a horse, though there are certain times when a last minute decision is made to do so. Partners are always sent email notification of their horse’s official Equibase entry along with past performance records for the race. How many people are there in each partnership? The number of partners varies, but our partnerships generally have from 5 to 20 members. What type of people comprise the partnerships at Dare To Dream Stable? Dare To Dream Stable partners come from all walks of life, different age groups and social backgrounds. We have had hundreds of partners over the years ranging from factory workers to lawyers to brain surgeons to retirees, with everything in between. We have had partners from all across the United States as well as from Canada. The one thing they all have in common is a desire to share in the thrill of thoroughbred racehorse ownership. Many new and lasting friendships have been made between our partners. Should I buy into a filly or a colt/gelding? This essentially boils down to a matter of personal preference. The most prestigious races are written for colts/gelding (such as the KY Derby), though there have been some females in history that have been good enough to compete in these races as well. As a result, the ceiling may be a bit higher for a colt or gelding, but it is also a bit harder to realize. However, fillies are easier to sell after their racing career. There are also plenty of opportunities for fillies and mares to run in outstanding and prestigious races as well. Colts do not have any high dollar value as a stallion after their racing career unless they achieve success at the absolute highest levels of racing (and geldings obviously have no stallion value at all), whereas a filly can offer value when sold as a broodmare after racing at more modest levels of success. It is also wise to keep in mind that a colt may indeed have to be gelded at some point in its career in order to reach its full racing potential. It really depends on the individual horse and is based upon its health and ability to compete. Most of our horses campaign at least through their three-year-old season. Some will continue on to campaign as four-year-olds and older if they demonstrate a reasonable chance to be competitive and/or increase their residual value. Does Dare To Dream Stable offer private equine management services? Definitely. We can provide comprehensive management services for individuals or even groups of friends interested in exclusive racehorse ownership. Dare To Dream Stable Management can handle the all day-to-day operations, equine management, paperwork and financial/bookkeeping functions, while you enjoy all the benefits of being an owner without the hassle and time consumption. Please contact us for further information on this type of program. How much do Dare To Dream Stable Partnerships cost? Costs differ from horse to horse and by percentage of interest, but as an example a 4% interest typically ranges in price from $1,000 to $5,000. What does the initial cost of the partnership include? The initial capital contribution covers the partner’s interest in the horse, all acquisition expenses, entity startup costs and estimated training/maintenance costs through a stated period of time that will usually be from 3-9 months, depending upon the amount of training estimated to get that horse to the races initially. The initial capital contribution does not cover race day related expenses incurred in racing the horse (jock mount fees, stakes nomination/start fees, etc.). What are the monthly expenses of owning a horse after the initial expense reserve runs out? *Please note that Dare To Dream Stable does not “mark-up” any expenses. So on a 4% interest, the monthly cost would be approximately $136.00 plus an additional $5 to $10 for office related expenses. Most races are free to enter. The only costs are jockey fees (avg. $65 for losing mounts up to 10% of purse $ earned for winning mounts) and the pony to post (avg. $25). Some stakes races do have entry fees, nomination fees and start fees which are based on a percentage of the purse size. How does purse $ distribution breakdown in a typical race? What are the fees for the race if the horse wins based on above example? For 2nd and 3rd place finishes, jock fees are typically 5% of the purse $ earned by the horse with off the board finishes being nominal mount fees of $65-$100. Trainer commissions are typically 10% of all money earned in placing in the top 5, while barn percentages are typically paid out only on wins. Manager commissions are 5% of gross purse $ earned. How does a partner exit a partnership while it is still ongoing? A partner wishing to sell their interest should be prepared to find his or her own buyer, as there is no readily available aftermarket. While Dare To Dream Stable Management may attempt to help you sell your interest, you should be prepared to be involved for the duration of the partnership, which is generally one to three years. What happens to my investment at the end of the partnership? If the partnership dissolves due to a claim or sale of the horse, then you would receive your pro rata share of sales proceeds after all expenses associated with the partnership have been paid. Any remaining money in the partnership’s account will be distributed based on your pro rata share after all partnership expenses and obligations are paid and satisfied. How active can I be in the management of the horses I own? 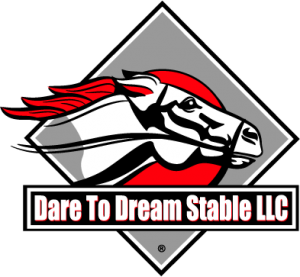 Dare To Dream Stable serves as the Managing Partner for all horses. We have extensive experience and knowledge of the industry and know how to place our horses in the best position for them to succeed. As such, we handle the day to day responsibilities of campaigning the horses. We do encourage discussion and input from the partners and are always willing to explain any decisions, but the final decisions on racing related matters are made by Management. What kind of interaction will I have with the trainers? Do you purchase disability/mortality insurance for the horses? As a general rule, Dare To Dream does not does not carry injury insurance on our thoroughbreds. In most instances, we do not carry mortality insurance either. There are some exceptions to this on an individual partnership/horse basis where warranted. Partners are eligible to purchase their own insurance for their portion of a horse in most instances and we can assist in that if desired. Can I obtain Dare To Dream Stable apparel? Yes, please visit our Merchandise page. If you do not see what you are looking for, please contact Allen Faber at 312-391-7223. STILL HAVE HORSE RACING PARTNERSHIP?